Covington is the Parish seat of St Tammany Parish, South East Louisiana, 37 miles north of New Orleans and Madisonville, on the Bogue Falia, U.S. Route 190, East of Hammond, South West of Bogalusa, near Lake Pontchartrain. The site was first settled in 1769 and incorporated in 1813. Covington, which sits in the fork of the Tchefuncte and Bogue Falaya Rivers, was founded by John Wharton Collins, a New Orleans merchant who migrated from Philadelphia soon after the Louisiana Purchase. Collins purchased the original town site of some 1600 acres in 1813. Collins sub-divided a portion of the site into streets and lots and called his development the Division of St. John of Wharton. However, when the Legislature granted the community a charter in 1816, the name was changed from Wharton to Covington in honor of General Leonard A. Covington, a hero of the War of 1812. The town became the parish seat in 1819, but the first courthouse was built on the east side of the Bogue Falaya at what is now called Claiborne Hill. It was later moved to it's present site on Boston Street. Like other towns on the North Shore of Lake Pontchartrain, early Covington boasted a variety of home-like resorts, most of which were located along the sandy banks of the picturesque Bogue Falaya River. The high and dry land in and around Covington is covered with beautiful pine, oak and magnolia trees, as well as flowering dogwoods and redbuds. The purple wisteria, azaleas and camellias add to the springtime riot of color. Many of the historic homes have been turned into antique and craft shops, especially in the Lee Lane area. Annual events include the Chef Soiree, Art at the Park, the Parish Fair, the Scarecrow Festival, Makin' Music, North Shore Weekend and Mardi Gras parades. The central business district of Covington is unique for its "ox-lot" concept. Each square in mid-town has a central core accessible by a 20-foot alley from two streets. The alley in one square runs north-south, while the adjoining square runs east-west. The ox-lots, which are now used for parking, were used to stable the oxen and other draft animals when farmers from outlying areas had to stay in town when bringing their crops to market. Recreation in Covington around the turn of the century was slow and easy. The veranda of the Southern Hotel was a meeting place where people could visit while they waited for the excursion boat to New Orleans. Dancing was a popular pastime, both in the hotel ballroom and at the Bogue Falaya park pavilion. Creativity abounds in Covington. The St. Tammany Art Association and many private art galleries are located in the downtown area. Many talented artists and writers call Covington their home. Perhaps the best known writer is Walker Percy, to whom this book is dedicated. The State Park is a particular points of interest and the local main trades include strawberries, cotton, oranges, naval stores, lumber milling, charcoal manufacture, wood preservatives, tung oil, fishing and hunting. Businesses in Covington which appear in 1988 Million Dollar Directory are: - Engineering Specialities, First National Bank, First National Corporation, Graham Resources, Housemaster Corporation, Plaquemines Bunkers and Whit Enterprises. It gives me great pleasure to welcome you to the City of Covington. Please feel free to explore our commercial areas and Downtown. Enjoy our beautiful neighborhoods. Explore "Made in Covington" where you will find many fine artists working in their studios. Sample the fine local cuisine of our many famous restaurants. Browse for antiques and collectibles. Visitors to our city enjoy the same relaxed pace and friendly surroundings that residents have grown to love. We hope that you will enjoy your time in Covington and we welcome your visit to our town. On July 4, 1813, John Wharton Collins, a New Orleans merchant, founded the city that became Covington on the edge of a parcel of land he owned in the fork between the Bogue Falaya and Tchefuncte Rivers. Collins laid out an unusual system of streets and squares with central lots and alleys that are popularly known as "ox lots." Collins named the town Wharton and dedicated it to Thomas Jefferson. When the legislature chartered the town in 1816, it was renamed with Collins strong objection to honor General Leonard Covington of Natchez who distinguished himself in the War of 1812. Two fires destroyed most buildings built before 1880. The original urban design is still visible, as are examples of late nineteenth and early twentieth century storefronts and residences. Visitors may savor the character of a small town at the turn of the century, enjoy shopping, dining and strolling under the majestic live oaks that frame many of Covington's streetscapes. - Division of Morgan, Commerce and Virtue - Laid out in 1813 as an "Avenue" along with the Division of St. John. Based on the same plan as Canal Street in New Orleans, a tree-lined neutral ground existed down the center of the Avenue. Joseph and Alfred Theard laid out the area in lots and squares in 1879. For the most part, the lots and squares were sold as family homes. As early as 1890, several businesses were opened, establishing the area as an industrial site. In this area were the St. Tammany Ice and Manufacturing Co., the Mackie Pine Oil Plan, Covington Grocery and Grain Wholesalers and the Covington Train Depot. - Covington Cemetary - On December 27, 1817, the founder of Covington, John Wharton Collins, died at his home in New Orleans. He was buried in Covington in accordance with his final request. He was interred on the corner of Columbia and Kirkland. His widow sold the surrounding land to the city five years later for a cemetery. - The Old Railroad Depot, 503 N. New Hampshire - On May 16, 1888, the East Louisiana Railroad reached Covington, heralding an economic boom. The original depot faced New Hampshire Street with a passenger and freight terminal facing east. During the mid-1900s, the Depot was moved one block to the present site (now a restaurant). - Covington Waterworks, c. 1930, 414 N. Theard. Stucco Mission Style building with baroque style shaped gable parapets and a Spanish style roof. It is the only building of this architectural style in Covington, and is located in the Morgan, Commerce & Virtue. - Old Covington Firehouse, c. 1930, 406 N. Theard. This two-story wood frame structure was built in 1940. Living quarters were on the top story and served as home to the family who answered the phone and sounded the alarm for the 3rd Ward (Folsom, Covington and Mandeville). In 1949 the Volunteer Fire Department received a new Seagraves Fire Engine. It was housed in this building while serving the community until the early 1970s. The building is now the home of the Covington Downtown Development Commission. - C.J. Schoen Middle School, c. 1914, 300 N. Jefferson. Formerly Covington Grammar School, this structure is the oldest school building in use in the parish. The school building was on this site as early as 1909. - Commercial Hotel, Patrick Hotel and Roubion Hotel, E. Gibson. In conjunction with the railroad boom, several hotels sprang up along the track. The Commercial Hotel and Patrick Hotel on the north side of Gibson Street were built after the 1906 fire (now commerce buildings and offices). - Covington Bank & Trust Building., c. 1885, 308 N. Columbia. The Bank of Covington was established in these original quarters. It is the oldest commercial building in Covington. - H.J. Smith and Sons Hardware and Museum, c. 1876, 308 N. Columbia. Oldest hardware and general store in the parish, housing unique artifacts on the history of Covington. Of note are the dugout cypress canoe and lead coffin. H.J. Smith and Sons was founded July 4, 1876. - Courthouse Square and Historic Oaks, 510 E. Boston. The first parish courthouse was located across the Bogue Falaya River in Claiborne. The second courthouse was erected on this site in Covington, c. 1850, to be demolished and replaced by the third courthouse, c. 1896. The fourth and present parish courthouse is graced by oaks planted more than 245 years ago, predating our street plan of 1813. - The Southern Hotel Building, c. 1907, 428 E. Boston. This building was constructed at a cost of $100,000. There were once 200 feet of galleries overlooking New Hampshire Street, a formal garden and tennis court. Tame and exotic animals resided in cages in the central lobby surrounding an artesian fountain (now parish offices). - The Bogue Falaya Mens Club, Old MCB Library, c. 1905. 131 N. New Hampshire. Constructed in 1903, the ladies of Minerva's Chosen Band purchased this building for the town's first lending. library in 1907. - The Christ Episcopal Chapel, 120 N. New Hampshire. Organized and founded in 1846, it is the oldest public building in use in St. Tammany Parish. - Original Gates to Bogue Falaya Park, End of N. New Hampshire. August 11, 1908, Dr. George R. Tolson sold to the town of Covington the 13 acres that make up the Bogue Falaya Park. - Patecek Building, 301 Columbia. In the early months of 1995, total restoration of this historic building began. Built shortly after the Great Fire of 1898, the building provides a beautiful example of turn of the century commercial architecture. For more than 60 years, 301 Columbia has housed retail stores and holds the distinction of its second floor being Covington's first telephone exchange. - Covington Bank & Trust II, 236 Columbia. Originally built in 1907, it served as the second Covington Bank & Trust building. The structure also housed a drug store and attorneys' offices on the second floor. After the bank's closure in 1934, it housed the first chain grocery store in Covington. During the tenure of the latest owner, the tile facade was added and renovations were extended on the second floor. - Seiler Building, 434 N. Columbia. Built in the early 1900s and still known as the Seiler Building, this historic landmark once housed one of the most prominent saloons, cafe and oyster bars in St. Tammany Parish. Of note were the massive solid mahogany bars and counters throughout this fine example of turn of the century urban architecture. - Champagne Grocery, 427 N. Columbia. This beautiful structure once housed the Champagne Grocery, founded in 1919, which remained open for more than 60 years. In a time when groceries were delivered and for many years after Champagne's was an important part of everyday life in Covington. When one thinks of the small town grocery and a distant way of life, one thinks of Champagne's. - Old Freezer Plant, 526 N. New Hampshire. Built in 1945 as the Growers Cooperative Association and better known as the "Old Freezer Plant," this building holds the distinction of being the first and only community freezer plant in the area. At a time when most families did not have their own freezers, this building once housed many a holiday turkey or ham. Many residents still remember picking up their store of meat from the freezer. - Columbia Street Landing, End of Columbia. The birthplace of Covington, this active harbor once docked schooners and steamers and brought many early settlers to Covington. Established in the early 1800s, it was a vital link to other river cities transporting cotton, lumber, bricks, whiskey and mail. Oyster luggers used the port to transport fresh oysters to the community through the 1930s. Today, Diamond Bullet Design, the creator of this web site, is located in the home at the street's end, just above the landing. - Covington Ice House, 322 N. Florida. This structure was built in 1910 and served as the Covington Ice House until the 1920s when it became home to D'Aquin's Wholesale Grain Company. Blossman Gas Company occupied the building from 1934 until it was renovated as Tyler Downtown Drugs and Cafe Cabaret. Covington is situated between the Bogue Falaya and Tchefuncte Rivers and serves as the Parish's finance, government, commercial and cultural center. Because Covington is in a region referred to as the Ozone Belt, it has long been known for its clean air and water. Downtown Covington's strategic location places it within 40 miles of New Orleans, providing a beautiful country setting in which to live, work and play. The City's numerous businesses include specialty, retail, government, nonprofit, and much more. The 28 square blocks of Downtown Covington house many historic buildings dating back to the 1880s. The City of Covington has a Mayor-Council form of government. The legislative power of the city is vested in the council, which consists of two at-large members and five district member. Covington enjoys a sub-tropical climate averaging 54 degrees in mid-winter to 81 degrees in mid-summer for a yearly mean temperature of 68 degrees. The healthy green foliage is due to abundant rainfall, averaging 62 inches annually. The average elevation is 9 feet above sea level. Because of Louisiana's close proximity to the Gulf of Mexico, hurricanes are an occasional threat from July 1, to November 1. West St. Tammany is served by two full-service hospitals with physicians representing some 30 medical specialties. Lakeview Regional Medical Center and St. Tammany Parish Hospital are 150-bed and 220-bed acute care hospitals, respectively. Covington's public primary and secondary schools provide quality education. There are two elementary (K-3), two middle (4-6), one junior high (7-9), and one high (10-12) schools. The Covington area also offers a selection of private and parochial schools for children of varied interests. In addition, two accredited four-year institutions, Southeastern Louisiana University and Tulane, as well as a junior college, Delta, offer greater educational experiences. The New Orleans International Airport, is only 45 minutes from Downtown Covington and is accessible by the Lake Pontchartrain Causeway, the world's longest bridge. Some 14 major airlines provide flights daily into and out of New Orleans offering easy connections to major cities throughout the Caribbean and the world. Three local, small aircraft airports are located in Abita Springs, Hammond and Slidell. 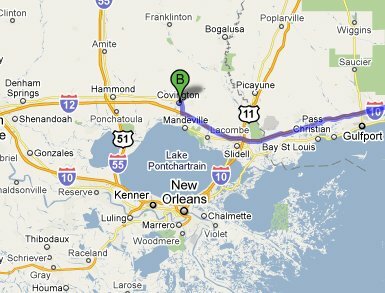 Commuter van pools and taxi services are available from Covington to the New Orleans area daily. Total cargo tonnage handled by New Orleans' ports is higher than any other port in the country. More than 480 million tons of foreign and domestic cargo were handled in 1990. In keeping with Downtown Covington's historic land uses, parking is located in ox lots and on streets around the city. Furthermore, parking is free of charge. Covington offers a wide array of festivals, events and outdoor activities for the entire family. 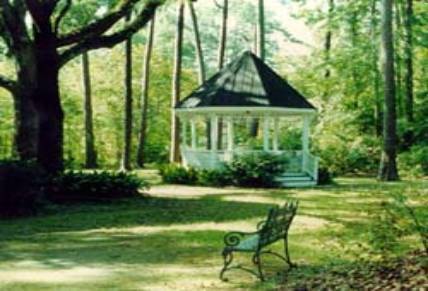 Some of the activities include: Mardi Gras festivities, the Civil War Re-Enactment, Heritage Festival, Bluesberry Festival, Fourth of July Festivities, Antique Town Fair, Scarecrow Festival, Historic Home Tours, Christmas in the Country, the St. Tammany Parish Fair, Makin' Music Festival, Chef Soiree, Art in the Park, Walker Percy Symposiums, and the list goes on. Contact the Covington Downtown Development District, St. Tammany Parish Tourist and Convention Commission or St. Tammany West Chamber of Commerce for dates and times.